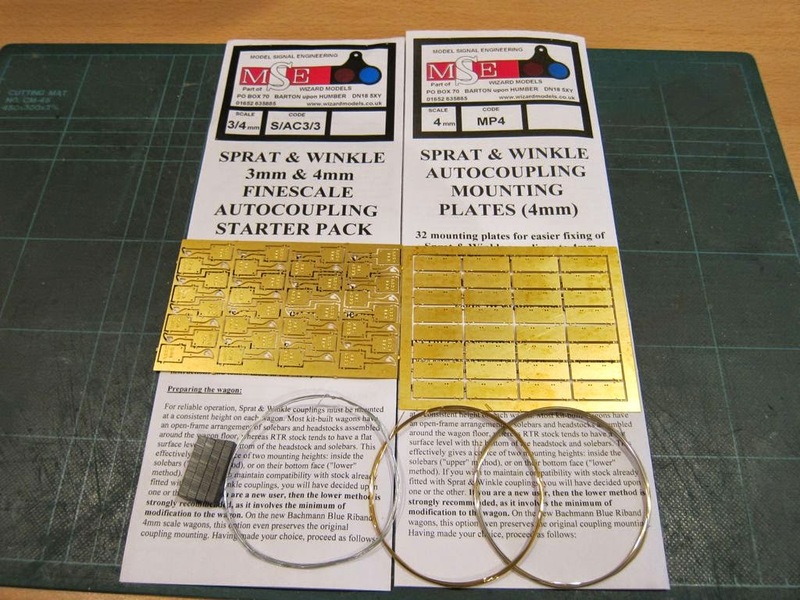 A day of learning today, playing with Sprat and Winkle couplings. I've never used them before, but as I'm finding 3 links in 4mm scale to be frustrating these days, I thought it worth trying an alternative. Alex Jacksons are certainly the most discreet coupling option available, but they can be a little fragile and prone to needing adjustment I've been told. Sprat and Winkles seem to have a good reputation and I like the idea of hands off operations and delayed uncoupling. You can buy a trial pack from MSE but I went for a starter pack instead, figuring I could experiment on a greater range of stock and get a better idea of their capability. A pack of the mounting plates made it into my basket as well on the grounds that they make the whole job of assembly and mounting easier. 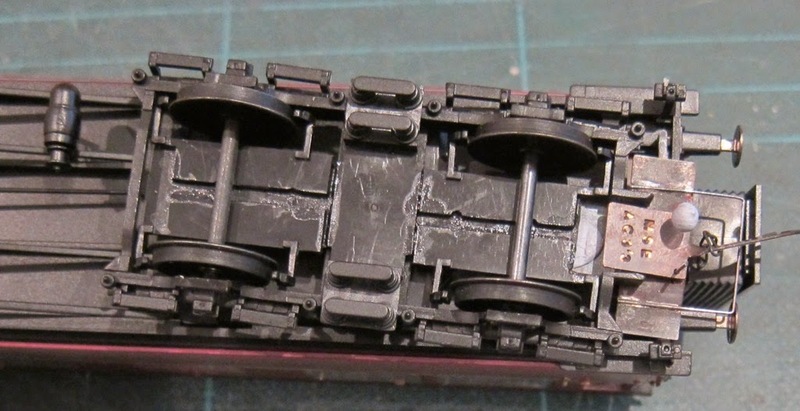 I made a couple of couplings up last night, fitted them to a wagon with the loop at the recommended height of 12mm above the rail and stumbled across my first problem - I was having to bend the loop up above the bottom of the headstocks meaning the hook part of the coupling was now pointing skywards instead of being horizontal. An quick email to Geoff and he suggested that 10mm above the rail was a far better height, but also that I was best to start with some coach bogies and use those to establish the height for everything else. 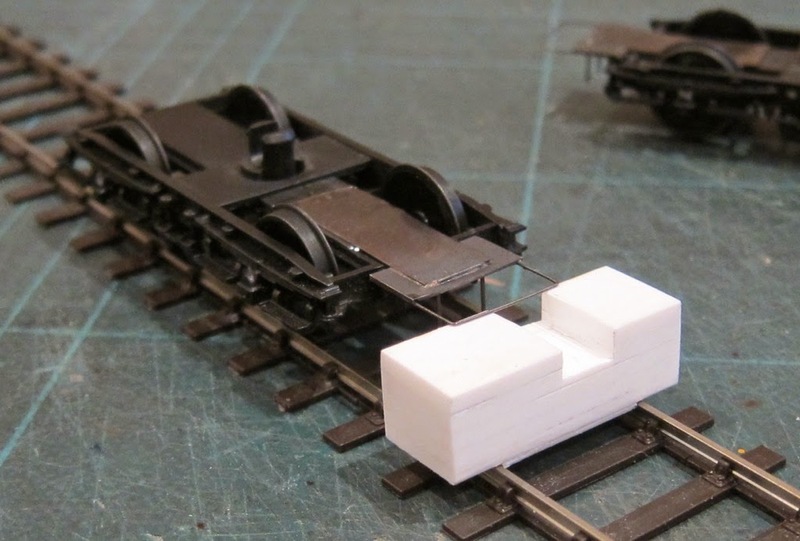 I had just bought a Hornby Hawksworth Brake 3rd to go behind my Pannier so this seemed the best option for a gauge and coupling conversion. 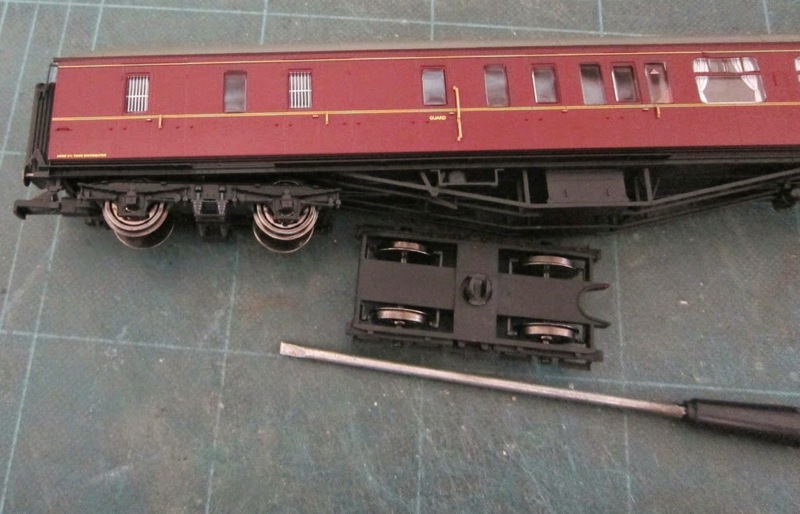 In terms of changing the coach to EM, I'll just point you towards Geoff's post on his Penhydd blog where he did the same, the only thing I did differently was to use a screwdriver to gently pry the bogies from their mounts. 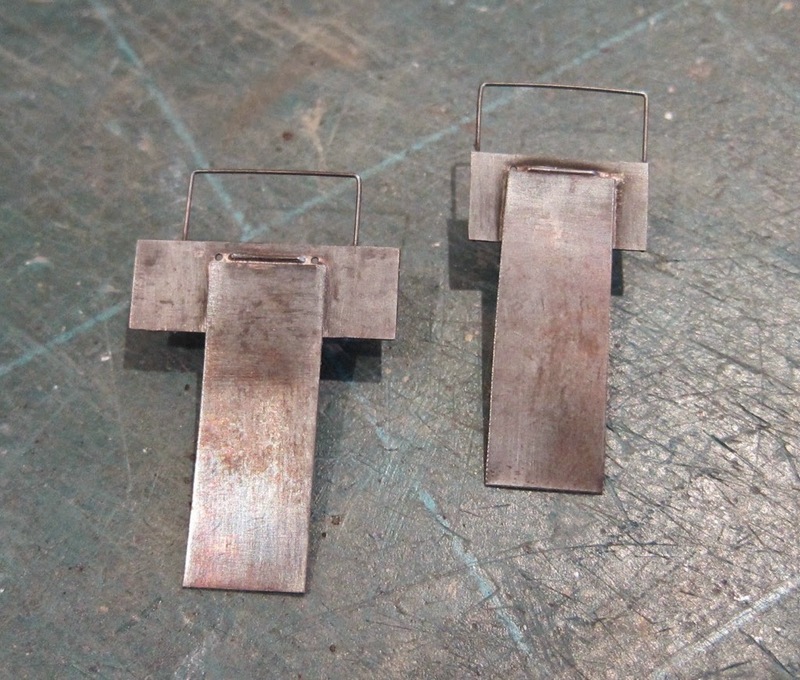 When it came to mounting the couplings, I soldered a length of nickel silver to the mounting plate to create a T shape - it was then possible to locate the T along the centreline of the bogie giving a bit of room for adjusting the final position of the loop in relation to the buffer faces. Whilst that worked nicely, it was pretty obvious that the mounting plates were hitting the coach steps, limiting the radius around which the coach could travel. The easy fix was to just trim the excess mounting plate off with a fret saw. Mocked back up in position, the bogie now has a greater amount of swing. The mounting plates were then glued into position with epoxy before the coupling loops were adjusted slightly to sit at the required 10mm above rail height. 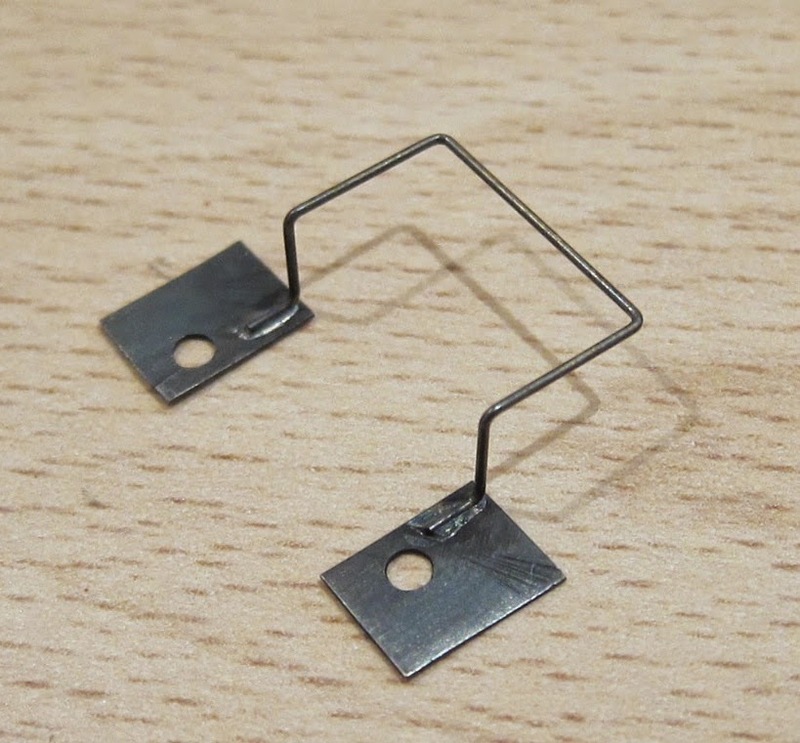 A simple jig made from layers of plasticard does the job of a height gauge. 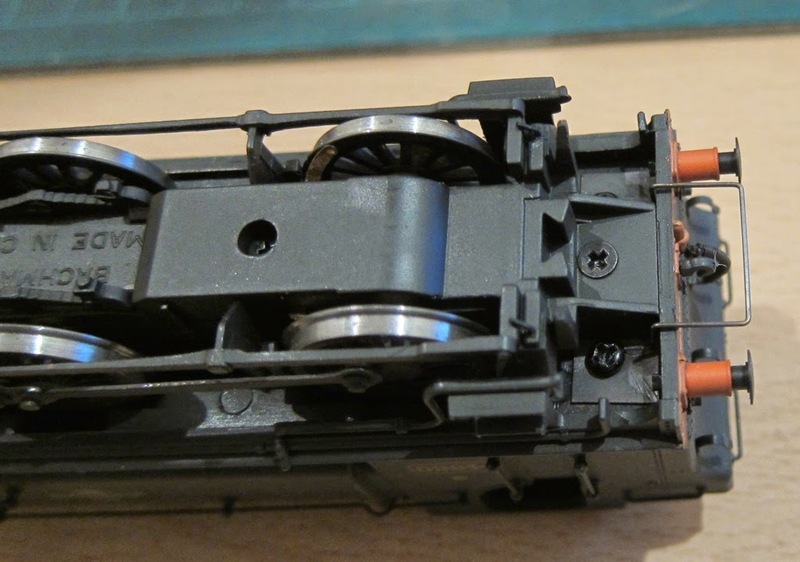 After a bit more playing about, I finally ended up with two converted bogies that would happily couple and uncouple from each other, so I then converted a wagon for comparison. The last job of the day was to create a coupling loop for the rear of my Pannier, a couple of nickel silver plates and some 0.5mm brass wire did the honours. It mounts using the two screws that hold the bunker in position.